One of my goals this year is to get faster at shorter distances, namely 5 km and 10 km. I’ve only run 5 km for training so I’ve never really pushed myself. Speed work is so important though, so I’m making an effort to be faster. I went for a 5 km run at lunch today. I wasn’t expecting it to be very fast, but it felt good. 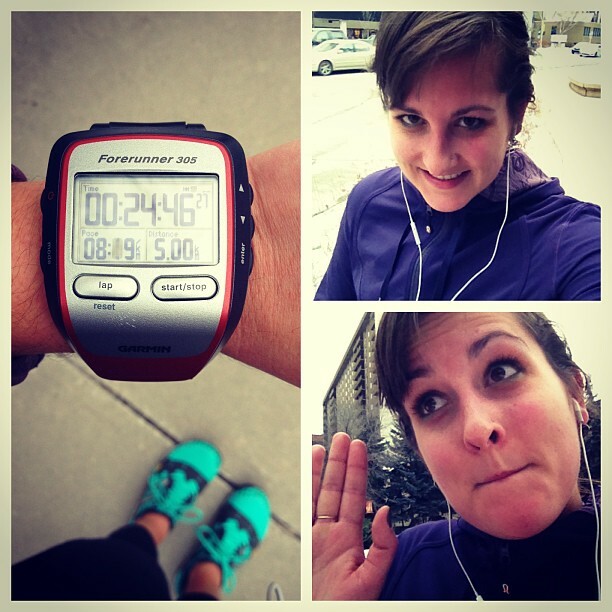 I didn’t really pay attention to my watch until I hit 2 km in 10:05. I never run 2 km in less than eleven minutes. And it felt good, really good. I did a bit of a double take, I was so surprised. So I decided to consciously try and keep it up for the rest of my run. At 3 km, I was right at fifteen minutes. Holding that 5:00/km, I kept an eye on my watch and by 4 km, I was breathing hard. I came in under twenty minutes. All I had to do was hold on for one more kilometre and I’d reach a goal I hadn’t expected to attain until much later this year. I mean, it’s January 7. I only set these goals a week ago! I just tried to keep my feet moving quickly and stopped my watch at 5 km: 24:46. My first time running 5 km in under 25 minutes. Walking back to the office, I was pretty much grinning from ear to ear. And doing a little happy dance.